A city over more than 21 million people full of mystery, intrigue, the ultra rich, the ultra poor and surprisingly fine coffee & beer. I’ve been fortunate to be flying here a lot lately with some long layovers to explore and begin to get to know the city. While my company puts us up in a very nice hotel in expat central a stones throw from Tiananmen Square, I’ve tried to venture from the worn path and get to know Beijing properly. Branching out on the subway lines one at a time has proved rewarding. It’s slow going but I’m learning to listen to the rhythm of the city and embrace its offerings. If I had any preconceived notions of the city they are long gone. The people are friendly, the beer is tasty, the coffee is proper and the place is downright photogenic. I’ve had to work at finding the local places, finding the small moments of peace & zen, coming out of my amateur street photographer shell and get used to the ‘big brother’ is watching you mentality but embracing it all is wonderful. 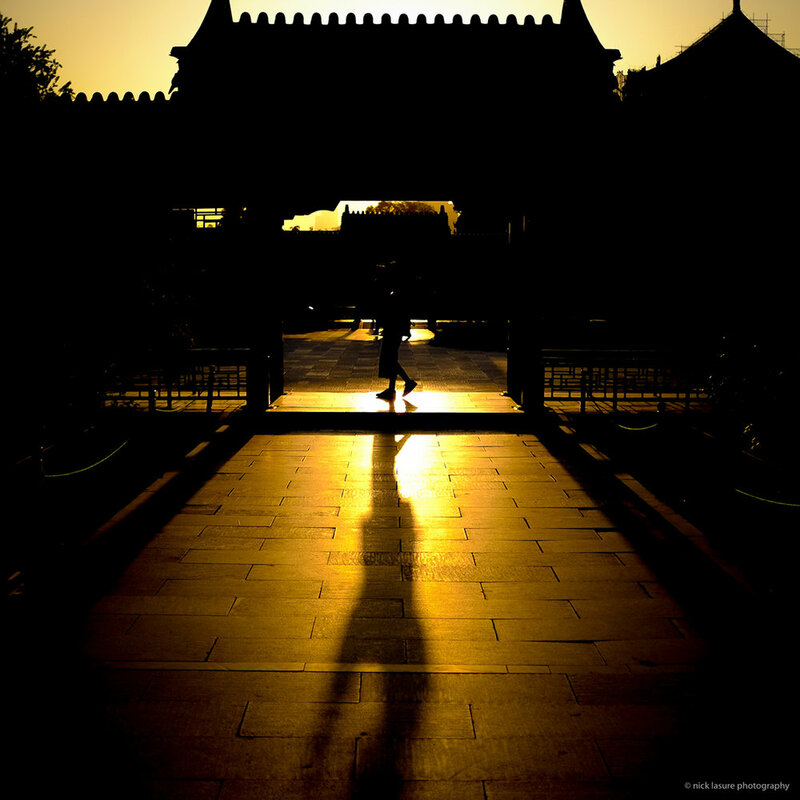 Beijing offers everything a modern metropolis does and doesn’t. The smells (pleasant & not), the sights (same), the dynastic history and the people make for a photo rich environment. I’ve found my everyday walk around camera (Fuji X100T) to be a perfect fit for blending in on the streets and making friends with its minimal intrusiveness. Though even its minimalist form has attracted the ire of security personnel a time or two already, a friendly smile and shrug of ‘sorry’ seems to accommodate them well enough. Certainly a different environment than taking photos in western countries though not insurmountable by any means. Just be sure to ask before taking photos any military/police or for that matter any seemingly sensitive locations. I’ll keep exploring and finding what Bejing has to offer. Stay tuned for more stories & photos from here and around Asia as I dig in deeper & work on my street photographer mojo. Perhaps an odd couple for cities, but my first trip on my new plane fortunately took me to Portugal and Switzerland. Managed a couple of quick walkabouts to put the Fuji X100T through the paces since I've been busy with training the last six weeks. Nice to get out & shoot again! This is the promised follow up about a camera that I purchased, sort of liked and then sold in short order. After much toiling I purchased the Panasonic LUMIX LX10 last year and initially really [sort of] liked it. It’s a small, sleek (errr...slick), functional and well appointed carry-everywhere-with-you camera. Yet, it wasn’t ultimately what I was hoping for. Let’s break it down and I’ll share a few images from my short journey with the LUMIX to see why it didn’t make the cut. One of the bright spots of the LX10 was the macro capability. Here we see Photo Lego Dude committing for the shot in Hawaii. One of the major factors in deciding on an everyday carry is the size & how it fits in your hand. The LX10 nailed both of those well enough, but it was almost too small without the addition of some sort of grip as it was a very slick camera to hold onto. Thankfully I never dropped it but came close a few times (love that wrist strap). The much lauded Sony RX100 series suffers from the same design flaw as well. A bit of grippiness could have gone a long way in keeping this thing around. The on/off switch was also unfortunately very easy to activate and I’d sometimes reach into my bag only to find the battery was drained. Clearly not a good thing if time is of the essence for a particular scene. After a short time of use the lens closure (automatic cover) developed an annoying issue. It wouldn’t fully close or open when turning the camera on/off. This of course didn’t affect the way it captured photos per se, but was a pain as I needed to pay attention so as to not miss a photo opportunity with the closure stuck half open (assuming the battery wasn’t dead). I ultimately sent it back for warranty twice for this issue and it worked great after the second fix. Nonetheless, I wasn’t overly impressed and lost weeks of time without the camera while it was being repaired. Mt. 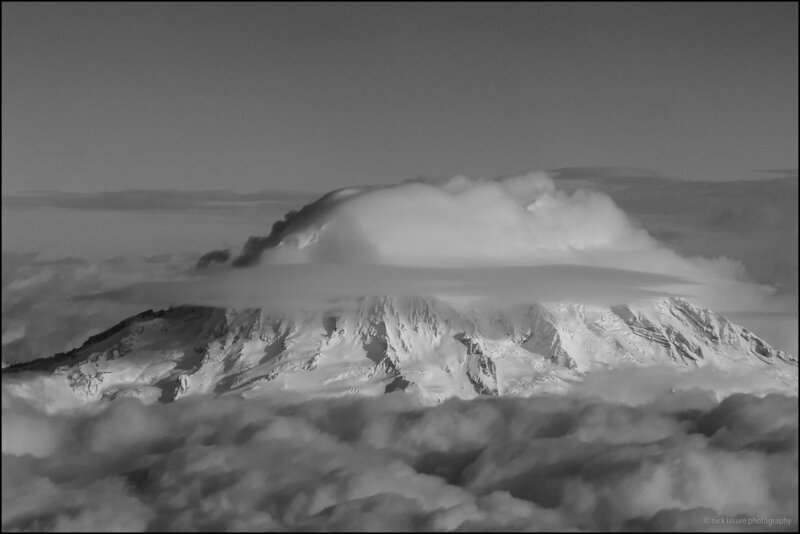 Rainier looking formidable above the clouds. I believe big zooms on compact cameras are in the gimmicky range but occasionally they are useful. For a small body and 1” sensor the LX10 actually captured pretty decent photos. The Leica f/1.4-f/2.8 lens is an excellent addition that I felt without the camera would have been pure ‘meh’. It is decently sharp with a useful 24-72mm optical zoom range and a slightly useful digital zoom for a touch more reach. The articulating screen while fairly standard on cameras these days is a welcome & useful addition for low angle shooting. I’ve really adapted and gotten used to having an articulating screen and fully believe they belong on modern cameras. The macro capability was actually quite good for such a small sensor and the focusing range nearly down to an inch it makes for easy floral shots or of course Lego Photograhers. Though technically most cameras come with what are better known as ‘features’ I like to call them ‘gimmicks’ depending on their usefulness. Things such as the aforementioned articulating screen and 4K focus stacking are arguably useless if they are not well executed. The 4K focus unfortunately stacking falls in the gimmicky range. I was looking forward to this feature for shots of Photo Lego Dude’s adventures, but in the end the results always left something to be desired. Better to manually stack images in Photoshop for truly sharp results. How about that touch screen you say? Actually yes, it was useful and I enjoyed being able to select focal points with it and navigating the less than stellar menu system with relative ease. Seems everything is touch screen these days and that isn’t always a bad thing. So not quite gimmicky. Low light/indoor shooting was mildly effective with the LX10, if you bumped up the ISO image quality was quickly lost. At the Tsukiji fish market in Tokyo. Chicago at night. One of the few favorite images that I captured with the LX10, for those that like natural star bursts f/8 worked perfect in this case. What else does one do in Tokyo but visit a cat cafe? LX10 had the occasional great natural tones with good enough light. The LX10’s portability was one of it’s best features, small & lightweight makes it great for coming along on the ride or in the backcountry. Ultimately I found the LX10 uninspring and at times frustrating to shoot with but also occasionally useful and fun. I’ll probably miss it at times, but it wasn’t a camera that I felt I could get repeatable results with or print with confidence if I did capture a good moment. Would I recommend it as a general point & shoot for vacation memories or backpacking camera? Certainly. But for the discerning pro or enthusiast who needs a little more from their everyday carry looks elsewhere. Something like say...oh a Fuji X100 series. One of my best selling & favorite images from Sri Lanka also happens to be one of my most stolen. The Demodara 9 Arches Bridge is an iconic structure built by the British when Sri Lanka was still called Ceylon during WWI. To create this photo my wife and I journeyed along the tracks, sweated profusely, made it through a tunnel full of bats, met friendly folks clearing fields with machetes and I even got my first leech to capture this photo. Then we even got to ride back on another train for about 25 cents (USD) and were able to cross the same bridge to Ella where we were staying, it was a fun but exhausting day. It was all well worth it and just one example of what photographers do to capture the images you see. From postcards to online use, this picture has been illegally used by many companies. I've spent this week tracking down image thieves, issuing invoices and take down notices. Please, if you are going to use someone's work for commercial purposes do it properly! Good photography isn't done cheaply, easily or for free.